I said goodbye to my Michael Hauver Barbecue Bob 12 String Guitar which sold on eBay Wednesday March 24, 2010 at 22:30:13 EDT. The buyer communicated that the guitar was even more than he expected. I am pleased that it has found a happy home. I have owned and enjoyed playing this guitar since 2006. This guitar sounds so good just doing some of the simple Lead Belly runs like the start of Leaving Blues. I later changed the 3rd string pairs to play in unison but the guitar in the auction has them back in octaves after the new setup. I have also experimented setting it as a 10 string, a 9 string and a 6 string. Barbecue Bob himself probably used his Stella as a 9 or 10 string - this seems the only way he could do those wonderful snaps on the bass strings. I prefer to finger pick without picks and the 9 string setup is great for that. I read Skip James used a Stella 12 string strung as a 6 stringer for his 1931 Paramount session. Also D G A7 to play key for the actual key of A. And G C D7 to play key actual key of D.
I have read on other blog postings that modern "Stella" guitars like those made by Mike Hauver sound "new" and don't have the old vibe of a real Stella. Of course on a real Stella from that period the wood will have aged quite a bit. However, I would guess nearly all of the Stellas on the 78s from the 1920s & early 1930s were fairly new at the time of the recordings so those would have to also sound new. Finally, the Stellas from that period were cheap factory made instruments and the modern Stella "Clones" like this guitar are made with great care and expertize and not sold for Cheap Prices when new. Mike Hauver does the repairs, neck resets etc for Neil Harpe's Stella Guitars and he probably knows as much as anyone about the construction of original Stellas. More on the 12 string guitar. I has captivated by Lead Belly and bought my first 12 string in 1966 or 1967. It was a Contessa Acoustic (Japanese) costing $99 from the local music store. I'm sure it was constructed with laminated woods but it sounded mighty good to my ears at the time. I bought the Leadbelly 12 String book by Pete Seeger & Julius Lester for $2.95 and was soon walking the basses and learing many great songs like They Hung Him On A Cross and Down In New Orleans. I also learned to play Mississippi John Hurt's Casey Jones (his only 12 string performance that I know of. First Issued on a Piedmont LP). Blind Willie McTell was beyond my grasp at the time (not that I could play like he does today). Later I began learning to play harmonica, banjo, dulcimer and fiddle. I'm not sure what happened to the Contessa - probably traded it in on another instrument like a cheap Japanese Blue Grass banjo I used for learning clawhammer banjo at Lundberg's in Berkeley. Forwarding to the 1990s the next 12 String Guitar I bought was a Sigma modeled after the Martin D-28 Herringbone that was never available as a 12 String. The Sigma 12 was a decent sounding & playing 12 string guitar. Then a few years later I purchased a Rickenbacker 330 Electric Guitar. This was actually a birthday present from my wife Amy. One interesting thing about the Rickenbacker is that the string courses with octaves have the low note first and then the higher note. The 330 was hard to play as the neck is too narrow - the same width as their 6 string. They actually use the same neck for both models. It is interesting the way their 12 sring tuners are designed and installed. I bought the Roger McGuinn 12 string video and he revealed how he plays his Rickenbacker using 1 finger to cover two courses (or 4 strings). I still could not make a clean C chord (with 1st & 3rd Strings open and 2nd strings at the first fret). I sold that guitar on eBay at a slight profit 10 years later. I bought the Hauver in 2006 and an electric Danelectro 12 String around 2007 or 2008. I sold the Sigma on eBay for about 60% of what I paid for it 12 years later - imports don't usually hold their value. The Dano 12 string is an inexpensive clone of a guitar that never existed. The neck is wider making it easier to play and the one I have has the string pairs like the Rickenbacker. The Dano 6 string and bass guitars available now are copies of the early cheapies that people like Jimi Hendrix and John Fogerty learned to play with as kids. Jimmy Page of Led Zepplin still uses a cheap vintage Dano for some recordings. Duane Eddy has a picture of a Dano Longhorn Bass on the jacket of one of his LPs. In addition to the Roger McGuinn video there is a video by Ernie Hawkins covering some McTell items and the late Harry Lewman has a Lead Belly video. Harry Lewman also put out a fine Lead Belly Book with words and tabs to many Lead Belly songs. I believe No Stranger To the Blues is the book title. I never really got the hang of playing electric guitars but I'll posts some photos of my collection of Electric Cheapies in the future. In early February I still had enough Christmas money to buy another banjo or two. I surfed the web to Jeff Menzies' website. 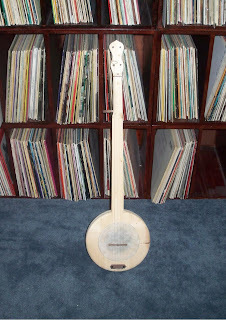 I noticed a Dipper Gourd Banjo and inquired about purchasing it. Jeff asked if I intended to actually play the instrument and offered me Gourd Banjos #35 #193 or #196 (the email include JPegs). I was so intrigued by the unusual look and the peg head of #196 that I bought it. See photo above. 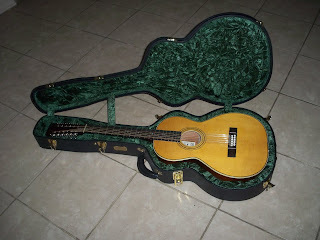 When it arrived I was amazed at the beauty of the instrument. It is obvious that Jeff was trained as an artist. This banjo has an unbelievable sense of balance, both physically and artistically. The neck is claro walnut with an apple wood fingerboard. Finally I tuned in up to low minstrel standard tuning (dGDF#A) and began playing it. The narrow finger board was not a problem as I rarely play above the 5th fret position. The action at the nut was perfect. The pot is smaller but deeper than my Banjo Factory gourd banjo. I've seen people on youTube playing Gourd Banjos (while sitting down) with the instrument between their legs - that does not work for me. I place the gourd on my right leg and anchor it down with my elbow at the spike extending through the instrument. The sound of this banjo is excellent - plenty loud with full deep tones. This Gourd Banjo is a bit more expensive than the one from the Banjo Factory. I will say that both are excellent instruments - you pay more for the artistic beauty of Jeff's banjos. Here is the link to the Jeff Menzies website. Several weeks back I first saw Brian Carver's youTube channel. 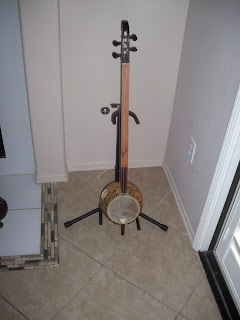 Brian is a college student who makes banjos, some similar in appearance to those that Frank Proffitt made and played. Brian created his own pattern that only uses two pieces of wood. Over the last year he has offered some nice ones made from Cherry and Walnut. He also introduced a Budget Line - Pine Mountain Banjos for $130 with free shipping. These instruments are made of pine and with walnut hardware (the nut, bridge, pegs and tailpiece) and have a 24 inch scale. They have been sanded but have no finish or stain and the instrument can only support light nylon strings. Brian still had one Pine Mountain Banjo available and he sold it to me (and I stayed within my Christmas money budget). The banjo arrived, I tuned it up to standard open A and began playing. The sound is not very loud but OK if you wish to play and sing by yourself. No worry about awakening my wife in the bedroom. Since I've been such a big fan of Frank Proffitt for the last 40 years I am pleased to now own a similar instrument. I have a feeling by this summer that I may wish to get a Walnut or Cherry banjo from Brian. I'll probably sell this banjo on eBay then. Check out Brian's youTube Channel. Listen to Baby-O by Frank Proffitt. Listen to Johnson Boys by Frank Proffitt. 12. Jimi Hendrix - Are You Experienced?